To be Shepherds with the smell of the sheep! As we eagerly await to receive and welcome our dear Pope Francis in Myanmar on 27 November 2017, I am reminded of his concern-filled words: "We need to go out then to the 'outskirts' where there is suffering, bloodshed, blindness that longs for sight, prisoners in thrall to many evil masters", and "go beyond the church walls". Currently, the world is witnessing our Golden Myanmar turning into a 'Burning Myanmar' with the Rohingya refugees, Kachin Internally Displaced Peoples (IDPs) and Kayah refugee returnees! 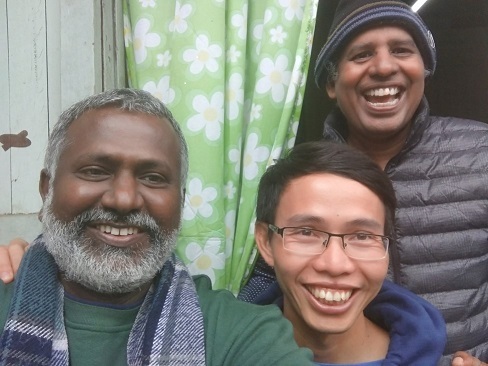 It is here, we, the Myanmar Jesuit Mission listened to the cry of our people and responded to the call of God to be sent on His mission. With this focused thrust Scholastic Vincent Pham Doan (VIE) and I were sent to the Diocese of Myitkyina in Kachin State. At St. Luke's College (SLC), a socio-pastoral formation centre, we serve 87 co-educational catechetical students from the four dioceses of upper Myanmar - Banmaw, Lashio, Myitkyina and Kengtung. It is here, we are deeply impressed by Pope's metaphor of sheep and smell. It is here we collaborate with an unassuming Fr. Leo Gopal, Director and his committed Staff in accompanying the 'smelling students' who have come from various outskirts. Since modern culture has torn apart our pastorally oriented people from their roots, it is here we encounter the stinking situations of 'our sheep and their smells' in their context, namely - war affected people and IDPs and their agony of frustrated, diluted life; huge number of poor in the mining areas who are at risk of death from dangers; huge number of drug affected youth, their families and their darkness of despair; life of young girls destroyed by human trafficking and slavery; and remote communities without socio-pastoral care, deprived of faith-justice formation. This situation needs liberation! In order to meet this need, SLC chooses young men and women from the affected communities who show greater generosity to offer their service without looking for great reward, inspired by older catechists. To these students, we at SLC, together with the EAPI Manila-the Philippines, offer the Joint Diploma Certificate. In our teaching methods, greater care is taken to contextualize ideas with reality keeping in mind the words of Pope "realities are more important than ideas" (Evangelii Gaudium 231). We have a highly-contextualized curriculum - lessons taught by the global and local professors, who are part of the suffering. As part of students' formation, they are sent regularly on weekends to our neighbour parish and social centres. Besides, an intensive two weeks of apostolic exposure was conducted for the students. They, with proper instructions, reached out to the sheep and returned with the smell of the sheep. Their areas of immersion programme were: pastoral care in the remotest communities without a resident pastor or religious; work in drug addiction centre; work with the IDPs in camp sites; work with persons with disabilities in the HIV centre; and peace initiatives with ecumenical and inter-faith communities. It is worth encountering students contextualizing joyfully the lessons learnt in the class rooms. When I asked them how they feel about their experience, invariably we heard them saying in Kachin and English, "Grai Kaja, Wa Jau - Awesome, Father!" Indeed, from our part it is worth smelling our sheep, praying, preaching and practicing during their apostolic exposure event! Seeing the socio-pastoral approach of the Jesuits, Fr. Leo said to me, "Fr. Girish, you as an associate director & professor and Sch. Doan as an administrator, besides your campus ministry you have very well reached out to our people! In fact, this is the first time the religious personnel left the campus and visited the students in their camp sites. I see that you Jesuits are quite different!" A very humbling and yet a challenging experience for me to listen to such testimonial words! Yes indeed, we are sent to make such a creative difference by thinking and feeling with the Church! May God bless our life, mission and networking process!